This year so far has found us moving back to our old hood for awhile before we head off to do more work in Indigenous Health in Broken Hill in the middle of the year. Actually we are not quite completed the pack up, but in the next two weeks we will be. I do love the area of the Highlands, but for various reasons it was right to move on. But moving is always an emotional time for me and I do find myself being catatonic at times and overwhelmed by feelings of hopelessness. Thoughts such as "will I ever get my life together", "why am I always doing this" blah blah blah. A saviour of working very part time and being at home with a little one is re-kindling one's creative side. Actually I think I do most of my creative thinking wallowing around in my jim jams in the morning, feeling a bit feral, with wild looking hair and everything just hanging out, dogs scampering about and child demanding textas , scissors and weetbix. I am still finishing off sewing and crochet projects from last year and trying not to start anything new. Although inspiring books are piled high next to the bed. I am completing a granny shrug from the vintage Panda book and my first little patchwork quilt. Storage boxes have been re-discovered with my paints and pastels and brushes within. Now that I have crossed the line and doing the count down to fifty years young, I feel quite liberated. My art dabblings are just for me and anything goes. And thank goodness I have started reading a book. It has been a post birth void in this regard. I have only just started the story of Sunday Reed and her artful life in Heide. I love a bit of history of what it was like in Australia for a woman. Hard to believe young aristocratic Austraian women were still presented to the Royal Court in the early 1900's. I would like a goal of reading a book a month. Joining in with creative peeps here and also with dearest Felicity . Click on image below for a literary feast. Jill you have put a bursting big smile on my face - thank you for this gift! Sunday Reed is one of the most intriguing of women and in fact when I was part of a little reading group a couple of years ago I titled it 'Friday Reads' as a bit of a cryptic homage to this wonderful woman. You've got me excited and I'm going to add this book to my list of 'must reads' for the year. 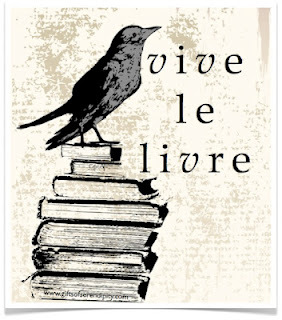 Thank you for joining in with 'Vive le Livre!' this month, I can't wait to hear what you think of the book. As for your creativity returning and the discovery of artful joys in treasure boxes - yay! Bright and happy hugs to you Lovely,'x'. Jill, I can't wait to spend some more time with you, maybe just hanging out being feral. I have just started back at a book club that I couldn't ever keep up with. So maybe when you settle back here we could spur each other on in the reading & crafting departments of life. Don't be so hard on yourself, it's great that you are a "wanderer". It worked for Donna Summer. It is always so lovely to hear from you Jill. You are such a clever lady. Love the crochet and the drawing. Working full time here for 6 weeks. Going quite well as my boss kicked in for a nanny!! (She is brilliant and we have had her work for us before in various capacities on The Farm.) Wouldn't want it to be forever but it is making a lovely change and we are trying to make the most of it as a different experience. So glad you are well. I hate moving. Just loathe it. I find it very unsettling. Have been wondering how your settling in was going. Glad to see you are picking up the hook. I love the vintage patterns and giving them a modern twist. I wish I could paint. Fortunately I am surrounded by loads of artists. So I have a great role playing the "art appreciater"! Moving house, whether it is a "good" move or not, is always unsettling and stressful.I would love to be closer to the sea to take long walks on the beach and breath in the salty air. Can also appreciate returning to reading. I got reaquainted over christmas. Started with "The Help". Moving is so stressful - hope it all goes smoothly. I love your painting...and I must look out for that book too, looks so interesting. Your mornings sound blissful to me...love your watercolour! Can I confess? Self employed and working from home, last week I did nothing to curtail the pyjamas and general all 'round feral until SIX IN THE EVENING. Makes me giggle, how none of my clients are none the wiser. Can't go wrong with Sunday Reed's story - so much material to draw from! your words are beautiful and can't help but smile aswell. good to read your news and lovely to see you doing things you are loving. Your granny squares are lovely....looking forward to seeing the finished creation. And as for dabblings, liberation and wanderings - you are who you are & have nothing to fear, it's all just plain goodness! The last comment was from me....hmmm, not sure what happened?